The Hover Camera may look like the skeleton of an old VHS tape, but its carbon-fiber casing unfolds to reveal a tiny drone capable of offering a high-quality aerial close-up. Like Lily before it, the idea of the Hover camera is to focus on quick and easy photography, not the intricacies of flying. The camera can hover at a set altitude or follow a particular subject. Hover is designed to record ultra-high-definition video and take 12-megapixel pictures, all controlled by a nearby smartphone connected via Wi-Fi. In a brief demo, the tiny quadcopter showed its promise, but also its limitations. It struggled outside amid a mild wind. A bottom-facing camera helps keep the Hover a steady height off the ground, but the lack of side-facing cameras leave it unable to avoid other obstacles on its own. Its modest battery means it can only fly for eight minutes at a time, though the company will likely ship several replaceable batteries with the device. Oh, and like other drones, it’s still on the loud side despite its small size. The Hover Camera is also fairly pricey for what it is. The device will likely cost several hundred dollars (the goal is less than $600) when it goes up for preorder this summer. The appeal of Hover is that its small size and basic functions will allow people to record both inside and out, and let them stay close to the action, whether that’s a wedding or a game of pickup basketball. Weighing just 238 grams, Hover is small enough that owners won’t have to register with federal regulators. 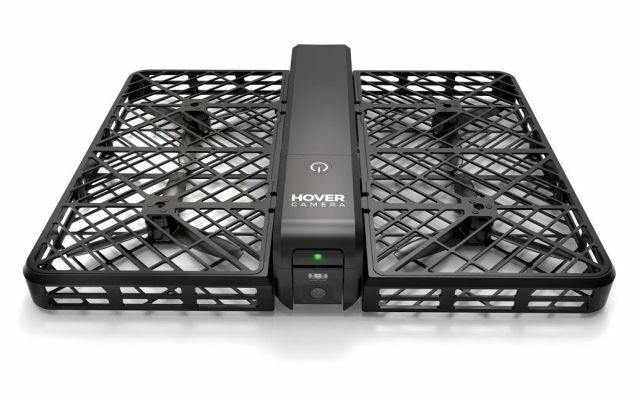 Hover is using Qualcomm’s drone technology, while Foxconn will do the actual manufacturing. The company has quietly raised about $25 million in funding over the past two years while remaining in stealth mode. Preorders aren’t expected to start until the summer. In the meantime, the company has built 2,000 units, and hopes to start a beta program with a few hundred units, where creative types can apply to try a drone for free via Hover’s website, explaining in a couple-hundred characters what type of imagery they would capture if given one of the camera drones. Even beyond the specific challenges Hover faces, there are similar obstacles facing all of these photography drones, including market leader DJI and a host of rivals. Just where the heck will people be able to use the things? At two recent press demos with different drone companies, that has been the most difficult part to arrange. Public parks in the Bay Area are growing especially tired of hipsters and their planes; few people here have enough space to make their backyard a viable option. Spending a few hundred dollars on a drone to record a few events a year is already a tough proposition. That could get a lot tougher if consumers can’t even find a way to record the events they most want to. That said, who doesn’t love a nice drone selfie?